New York – A United Nations envoy, dispatched by Secretary-General Ban Ki-moon, held talks with senior Ukrainian officials in Kiev and pledged the world body’s commitment to assist the country as it seeks to emerge from the current crisis. Robert Serry “delivered important messages from the Secretary-General, including that the United Nations stands in solidarity with all citizens of Ukraine”, UN spokesperson Martin Nesirky told reporters in New York. The Secretary-General sent Serry to Kiev as his Senior Advisor to assure all Ukrainian citizens of the UN’s support, and also convey that he expects all key international actors to work collaboratively to help that country at this challenging time in its history. 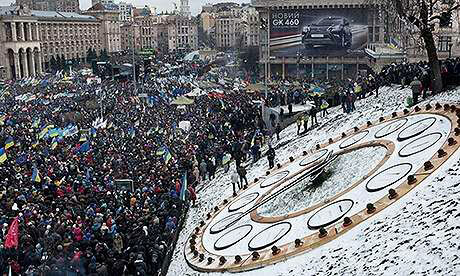 On Saturday, Members of the Parliament of Ukraine – which has been witnessing mass protests since last November – voted to remove President Viktor Yanukovych, and an arrest warrant has reportedly been issued for his arrest. The move comes after more than 100 people were killed last week in the latest wave of deadly clashes in the capital, Kiev. Serry has held meetings with, among others, the new Speaker of Parliament, the Vice Prime Minister, the acting Minister of Finance, and the acting Head of the Ministry of Foreign Affairs, to discuss the situation and concerted efforts to bring about a stable and prosperous future.